Sorry but I simply had to share Yankee's Cherry Vanilla fragrance - I bought it on a whim in B&Q a few days ago (does anyone else feel really manly in there?) and it has quickly become a firm favourite. Typically speaking Cherry or Vanilla for that matter are not scents I associate with the Autumn/Winter season but oddly the two come together and form a fragrance that is reminiscent of Cranberries. It is warming, sweet and very comforting...a lot like a fruit crumble cake! As most will know Yankee Candles can be a little hit and miss with some scents having a better scent throw than others - luckily the Cherry Vanilla fragrance is one of the best I have encountered from such brand in a long time. I kid you not when I say it fills the room with a sweet fruit essence in a matter of minutes, we are literally talking within 5 minutes of lighting the candle which isn't always the case with Yankee Candles. Despite having a great scent throw it is not at all overpowering nor is it sickly sweet or tart and is my current go to fragrance for firing up during the day when I am sat typing up blog posts. Bliss. 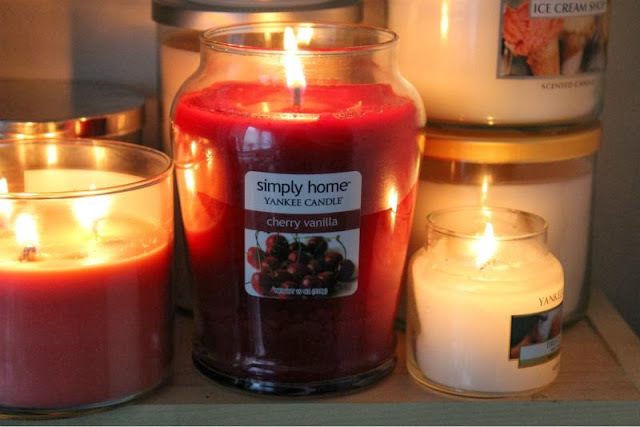 I should point out that Cherry Vanilla is not part of Yankee's normal line but their Simply Home collection which is basically Yankee's more budget friendly range i.e they are cheaper but many of the scents are the same but with different names and are often found in Supermarkets etc. A few have asked in the past if they are authentic and yes they are - I deem Simply Home to be a diffusion line and truthfully prefer the style of jars to the regular line up. I thought the name Cherry Vanilla sounded familiar, then I realised it's the same name as my hairdressers! Cherry and vanilla? Sounds yummy! Sounds really good, now you made me curious! Have to check it out, there has just opend a new yankee candle shop nearby so I will have to stop by next time I am in town. it's nice to make a post based on what you love.. I saw them yesterday! I was glad they're in Italy too, but them they're expensive...maybe I should search for other shops with better prices, I don't know. There wasn't a very large choice, but the moonlight-something, or something about night air (really good description hn?) was really good. If i can find them at better prices I'll buy it!